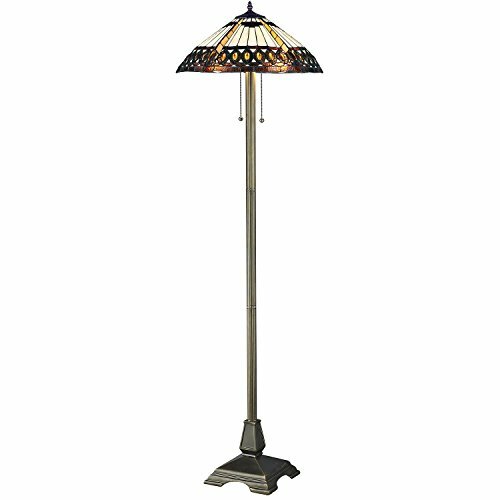 This elegant Amberjack Floor Lamp has been handcrafted using methods first developed by Louis Comfort Tiffany. Shade contains hand cut pieces of stained glass, each wrapped in fine copper foil.The dimensions for this beautiful lamp are W 18" x H60", uses 2 x 60 watt bulbs. 2 pull chain switches. Metal bronze finished base. CHIC DECOR - Fine lighting for any room, intricately detailed Tiffany style standing floor lamps. ELEGANT FORM - Artisan floor lamp. Hand cut, stained glass lamp shade, wrapped in fine copper foil. AGED CHARACTER - Mosaic floor lamps for living room, bedrooms, bedside, reading, boudoir or hallway. PERIOD FEATURES - Double lamp pull chain, rustic bronze tone base in warming amber yellow and cream. If you have any questions about this product by Serena D'italia, contact us by completing and submitting the form below. If you are looking for a specif part number, please include it with your message.